never not dreaming: Inspiration. 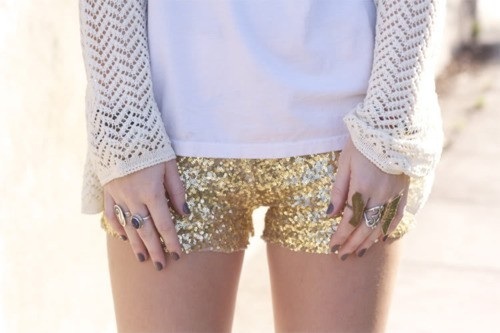 Sequin shorts. 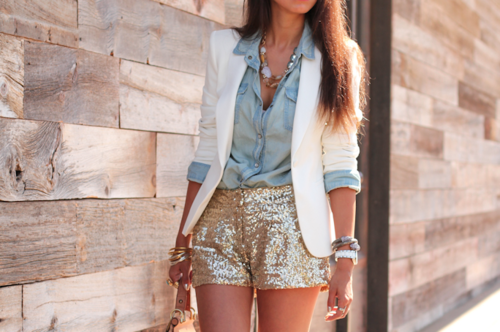 Sequin shorts are perfect to wear on a night out or just break your everyday outfit. I have been obsessed with them for quite some time, yes, yes, I happen to have quite a few obsessions... If I were to wear them tonight I would probably pair them with a silky shirt and a blazer for a smart Saturday night look. Heels are a must, that goes without saying. Below, I present some of my favourite looks ever. Chiara from The Blonde Salad just rocks them wearing the military jacket as well! I think sequin shorts are great for the winter season - just to break the routine of wrapping up in anything made of wool. Actually, they would look good with a chunky fitted knit. You can them in many colours in H&M this season. What you you wear your with?